Coravin review – is it worth every penny spent? 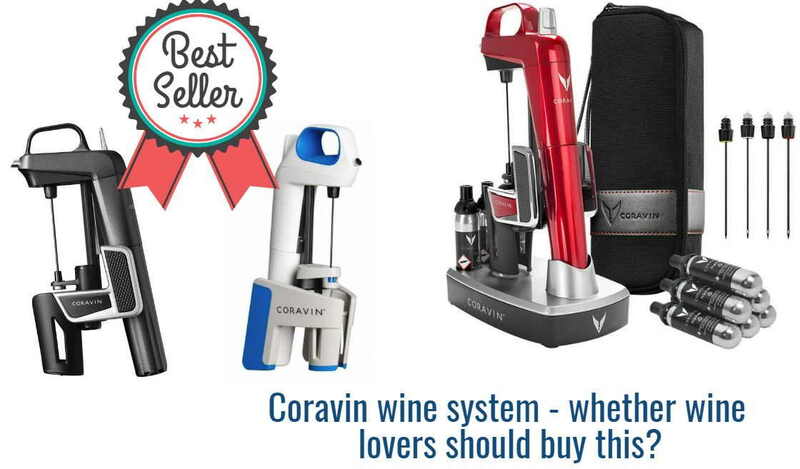 Coravin wine system review – whether wine lovers should buy this? The situation is familiar to many of us: you’d like to drink some wine, but you don’t want to open the bottle, since it is for some special case. Or another situation: your friends came, but all of them like different drinks – what shall you do with what is left in the bottles? 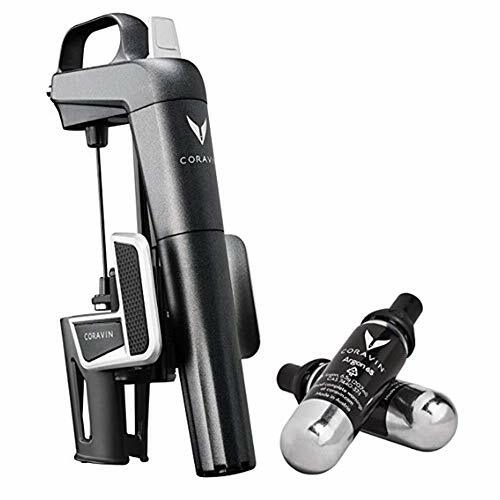 In 2013 Coravin introduced a wine bottle opener that allows to pour wine without taking the cork out. The drink is poured through the thin needle due to excessive pressure of inerting gas injected into the bottle. Life of wine lovers has become easier and happier once the device appeared. Wine from the bottle opened with Coravin can be stored for month and even years without getting spoiled. Not to speak of restaurant-keepers – this invention has really changed their business! 1 What is this thing? 2 Who needs Coravin wine system? We decided to study in details how the device works and find out if this is indeed a leading-edge invention on dispensers market. So, how Coravin manages to pour wine without opening a bottle? Its operation principle is based on stabbing a wine cork by means of wine saver needle, through which wine can be poured. The wine is pumped through Coravin and inerting gas gets into the bottle (usually it is argon which is quite spread in wine pouring). This gas prevents oxidizing. Since the cork has to be elastic, the device can be used with natural, sintered and constitutive composition natural corks. In this case, the bottle after using Coravin can be stored in any position: lying down, upright, inclined or any other way. Who needs Coravin wine system? If you have opened a bottle of 30-year-old wine, you’ll have to drink it all. This is not the drink you can just close with a cork and put into the fridge or mini-bar and drink some more wine later. Large amount of oxygen will quickly turn the ambrosial drink into some nondescript liquid. But here is a situation: you have asked a girl to come a have a glass of wine with you. You opened a bottle of old drink, but she didn’t like it much, since she prefers white wine. Ok, you have a bottle of white wine. The problem is – what to do with the red one? It’d be rather wasteful just to throw it away. Though, leaving the bottle open in the fridge, where it gets spoiled, isn’t an option either. Here is the way out – a magic wine saver made by Coravin. There is no magic, though, it is all about mechanics and modern technologies. A thin hollow needle easily stabs a cork (you don’t have to remove foil either) feels the bottle with inerting gas to create the pressure and after this wine easily flows from the bottle. After taking this “corkscrew” out, the tiny hole in the wine cork immediately closes and no air will get into it. The only drawback of using this system is that you’ll need to buy special capsules with inerting gas, which are costly. Greg Lambrecht, the inventor of Coravin wine opener created this device when his wife was pregnant. Due to the pregnancy his wife stopped drinking alcohol and he couldn’t drink a bottle of wine alone. The wine got spoiled and this was a very sad thing to see for a wine enthusiast. In the end, he found the workaround and shared it with everyone else. To pour wine by means of Coravin Wine System corkscrew you should stab the cork with its needle, push the button on top and incline the bottle, so it is comfortable to pour the wine and then push the trigger. The process takes less than a minute, since the time required to pour 140 grams (this is the capsule capacity) is about 25-29 seconds. The key feature of the mechanism is a capsule filled with argon. This is a colorless, tasteless and scentless gas that creates pressure in the bottle and “pushes” the wine into the glass through extremely thin hollow needle with teflon coating. After this the cork closes naturally and becomes sealed again. The capsule contains 99,9% argon and ensures that wine preserves its unique taste and smell. The thing is that oxygen as a component of the air that we breathe, it causes oxidizing processes whatever it interacts with. Argon is also a gas and it is present in the atmosphere as well, but in smaller amount. Though this gas doesn’t play any significant biological part and doesn’t form any chemical compounds at room temperature. According to our experience, one capsule is enough for 1-2 month of utilization (depending on how often you use the device). Select a bottle of wine you’d like to taste – Coravin can be used with all still wines with natural cork. Stab the cork with the needle to get to the wine. With one move quickly push the trigger to pump the gas into the bottle. Argon – is a safe inerting gas used by wine-makers. The bottle neck should be lower than its bottom. Let go the trigger to pour the wine into the glass. When the wine reaches the required level, just put the bottle upright. If necessary you can repeat the procedure. After you take the needle out, the cork closes the hole in it due to its natural elasticity and you can store the wine for a long time again. 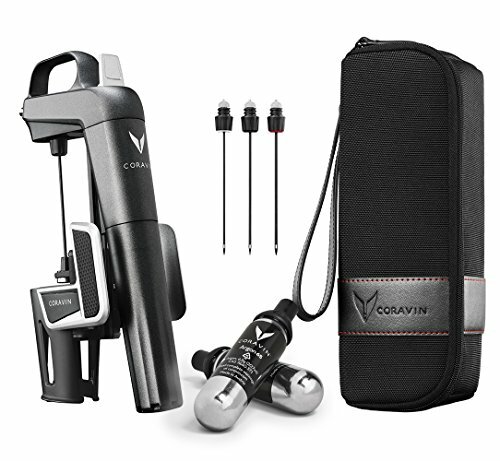 Coravin can be considered relatively young company – it was founded in 2011. Its headquarters are located in Burlington, Massachusetts. Greg Lambrecht is its founder, though he is more famous as an inventor of medical equipment. However, in a short period of time he’s gained popularity in wine-making field as well. Since he introduced a unique Coravin System to the world. Quite fast it has become popular among the specialists and lovers of this distinguished drink. Coravin has become so popular that in autumn, 2014 the company opened its representative office in Europe (in Netherlands). Nowadays, the company is run by Frederic Levy, the ex-president of famous corporate group Nestle Espresso USA. In 2013 Coravin got two awards. The first one was from American magazine Popular Science among the Best of What’s New. The second award was from the magazine French Wines Review (La Revue du vin de France) – it was awarded as «the most innovative product in the wine-making field». This is a whole new product for wine lovers among all designed for the last 30 years. This is an overwhelming device. Coravin will fundamentally change the way of drinking wine due to the possibility to open as much bottles from your wine cellar as you want. A journalist from USA Today, Jennifer Jolly said that «this is incredibly cool». With Coravin the process of wine consumption gets to a new level. There is no place for doubts any more – whether to open the bottle or not; or how to define wine quality without opening a bottle. You don’t have to get upset because of pouring out the wine that remained, if nobody drinks it a few days later. All wine systems present on the market nowadays require opening the bottle and taking the wine cork out. This leads to wine oxidation from the very beginning and further wine storage using inerting gases can’t be a long term one. Coravin allows to store wine during months and years without changing its initial characteristics. Friendly and functional design featuring durable plastic and bright soft touch grips. It is the perfect system for newer wine lovers to enable exploration and cultivate a lifelong passion for wine. The manufacturer positions this model as a basic one for those who like having wine every day. The outer “shell” of the Model One is made with more polymer material and less aluminum and chrome than the Model Two. This model is available in two colors – white and light blue, but it has no additional features. The product scope of supply has everything necessary to use it right after buying. Its owner won’t have to get anything additionally. 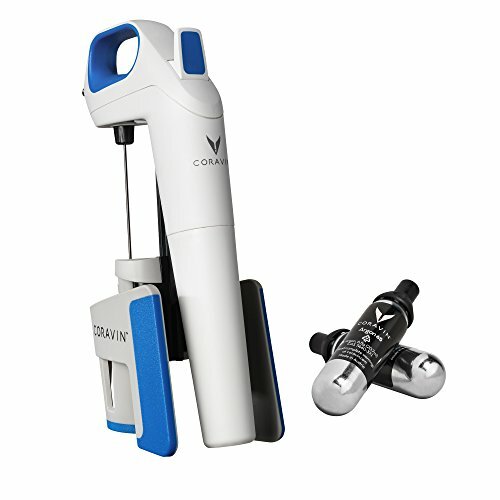 The difference from the first model is that Coravin Model Two has three major changes: duralumin case, textured rubber grip and more accomplished system of bottle neck grip. Due to this the opened bottle can be stored even in upright position. The set includes a standard needle, which can be used for most of still wines with soft corks (made from natural corkwood, sintered and those with compound structure). Its main difference from the previous model is that there is a variety of colors you can choose from, chrome accents, three additional needles and a Carry Case. Nowadays this is the most luxury set. 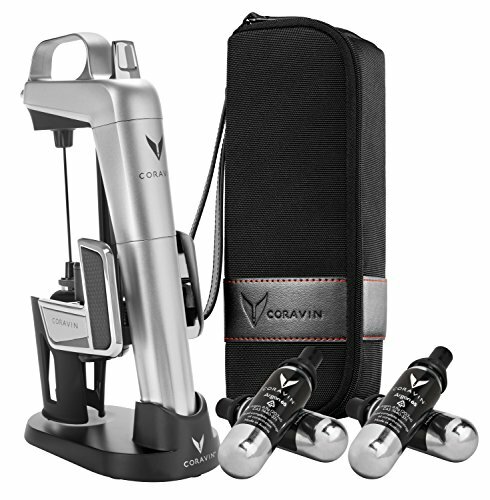 Coravin Model Two Elite Pro includes the main device Model Two Elite (you can choose the color), 5 different needles, stylish carry case with zipper, Storage Base, a case for a standard bottle of wine 0,75 l and 4 capsules with argon. Such scope of supply will be enough for household and professional use. At CES 2018 exhibition Coravin demonstrated a new version of its device that allows pouring wine from a bottle without opening it. The new device called Model 11 is introduced as «the first in the world completely attached and automatized solution for wine canning». In addition to the function of pouring wine available in the previous version, Model 11 can synchronize with Coravin Moments App. In this app you can see how much gas is left in the capsule and many other useful information. The application can also advise which wine from those available in the wine cellar is better for some specific event or dish as well as to recommend which wine to buy. Information about wines is taken from wine application Delectable. Model 11 has some other functions which will be definitely appreciated by wine enthusiasts. For example, the possibility to mount aerator is mentioned. Presumably the new device Coravin Model 11 will come in the market in September and it’ll cost $999. For relatively moderate price you get a possibility to drink a glass of wine when you want it and store the “open” bottle for several days and even weeks! In June, 2014 there were 13 complaints that bottles blew up when being opened. The founder of Coravin sent a present to the injured (we can use this word, since some of them did get some injuries) – a protective neoprene tube for bottles. At the same time Greg Lambrecht said, that according to his calculations only one bottle of 70,000 can blow up. However, this will be due some small cracks in the bottle glass or when the bottle was dropped on the floor, or it was carried in a bag carelessly. Nowadays, there has been no more complaints from users in this respect. Food Cycler Platinum – turns your household organic waste into “gold”! The 60 Seconds Salad Maker – a fast and easy way to make a salad in 60 seconds! Roborock S5 review – has it really become better or is it just another marketing trick? Metal detector for gold – how to choose the right one?